19 On the evening of that first day of the week, when the doors were locked, where the disciples were, for fear of the Jews, Jesus came and stood in their midst and said to them, “Peace be with you.” 20 When he had said this, he showed them his hands and his side. The disciples rejoiced when they saw the Lord. 21 (Jesus) said to them again, “Peace be with you. As the Father has sent me, so I send you.” 22 And when he had said this, he breathed on them and said to them, “Receive the holy Spirit. 23 Whose sins you forgive are forgiven them, and whose sins you retain are retained.” 24 Thomas, called Didymus, one of the Twelve, was not with them when Jesus came. 25 So the other disciples said to him, “We have seen the Lord.” But he said to them, “Unless I see the mark of the nails in his hands and put my finger into the nailmarks and put my hand into his side, I will not believe.” 26 Now a week later his disciples were again inside and Thomas was with them. Jesus came, although the doors were locked, and stood in their midst and said, “Peace be with you.” 27 Then he said to Thomas, “Put your finger here and see my hands, and bring your hand and put it into my side, and do not be unbelieving, but believe.” 28 Thomas answered and said to him, “My Lord and my God!” 29 Jesus said to him, “Have you come to believe because you have seen me? Blessed are those who have not seen and have believed.” 30 Now Jesus did many other signs in the presence of (his) disciples that are not written in this book. 31 But these are written that you may (come to) believe that Jesus is the Messiah, the Son of God, and that through this belief you may have life in his name. Our Gospel in Context. This Johannine account of the appearance of Jesus follows upon the heels of the events that took place at the tomb in the early morning of the first day of the week (John 20:1–18). There, near the empty tomb of Jesus, the risen Savior first appeared to Mary Magdalene. Our gospel contains the second and third appearances of the risen Jesus. These three appearances take place in Jerusalem. There is a fourth and final appearance of Jesus later in a section referred to as the “Epilogue” of John. That appearance is at the “Sea of Tiberias” in Galilee (John 21). The people involved in the Johannine scene in the garden (20:1-18), despite the testimony of Mary Magdalene, are locked in a room for fear of the Jews (v.19). The proclamation of Jesus’ resurrection has not dispelled the fear. The “we” and “they” of v.2 are still active forces in the account. The disciples (we) have not overcome the fear that the Jewish leadership (they) have created throughout the Passion. The evangelist begins his account of what happened later that day, “On the evening of that first day of the week, when the doors were locked, where the disciples were, for fear of the Jews.” He does not tell us how many disciples were present on this occasion, though the statement in 20:24 that ‘Thomas (called Didymus), one of the Twelve, was not with the disciples when Jesus came’ suggests ‘the disciples’ included at least the Twelve less Thomas and Judas Iscariot. Peter and ‘the other disciple’ had seen the empty tomb, and Mary Magdalene had seen the Lord and passed on his message to the disciples that he was soon to return to the Father. Nevertheless, the disciples (with the exception of ‘the other disciple’) had not yet realized that Jesus had risen from the dead. They were still afraid of what ‘the Jews’ might do to them as his followers, and secluded themselves behind locked doors. These locked doors might keep out the prying eyes of ‘the Jews’, but they could not exclude the risen Lord. The Fourth Gospel speaks often of Jesus being sent into the world by the Father: to do his will (6:38–39; 8:29), to speak his words (3:34; 8:28; 12:49; 14:24; 17:8), to perform his works (4:34; 5:36; 9:4) and win salvation for all who believe (3:16–17). That the disciples were sent to continue the words and works of Jesus is foreshadowed at various places in the Gospel: Jesus urged them to lift up their eyes and see fields ripe for harvest, and told them he had sent them to reap where others had labored (4:35–38), he said those who believed in him would do the works he had done and greater works than these because he was returning to the Father (14:12); he told them, “I … chose you and appointed you to go and bear fruit that will remain, so that whatever you ask the Father in my name he may give you” (15:16), saying that when the Paraclete comes “he will testify to me. And you also testify, because you have been with me from the beginning” (15:26–27), and when he prayed for his disciples he said to the Father, “As you sent me into the world, so I sent them into the world” (17:18). This last text, which parallels 20:21, confirms that the sending of the disciples was ‘into the world’, i.e. with a mission to the world. The other texts reveal the essential content of their mission was to ‘harvest’ men and women for the kingdom by their witness to Jesus by word and deed, alongside the ongoing witness of the Spirit. Verses 21–22 are a key passage in Johannine theology. The disciples receive the Holy Spirit at this second coming of Jesus: the eschaton, the final era, is now; future is present. In 7:39, the Spirit had not yet been given, since Jesus was not yet glorified. On the cross, Jesus, manifesting the nature of God, which is love, delivers over the Spirit (19:30), symbolized immediately afterward by the flow of the sacramental symbols of blood and water. And now, at his first encounter with the believing community, he breathes the Spirit again as he celebrates the re-creation of God’s people. Simultaneously, he sends out these disciples just as the Father had sent him (v. 21). His mission becomes theirs; his work is placed in their hands. And that mission, that work, is to manifest God who is love in their words and deeds. Through them now, enlivened by the Spirit, will the presence of God become known and seen and felt in the world. . While Jesus’ words about sending his disciples as the Father sent him applied immediately to the apostles, in Baptism all believers are privileged to share in this commission in so far as they all are recipients of the Spirit whom he bequeathed to his disciples (see 20:22). With the particular enabling that Spirit provides, each plays a part in continuing the work and witness of Jesus. Verses 22–23, which speak clearly of the community’s share in Jesus’ power to forgive sins, can be simply a reference to baptism, the traditional sacrament of forgiveness, or to the church’s continuous preaching of forgiveness of sins in Jesus. But this reference to sharing in Jesus’ power probably intends more than that. Through the ever-present Spirit, the Christian community can offer a restored union with Father and Son, a divine indwelling that creates peace (v. 21) with God and neighbor. Over the centuries, Christian communities have developed different means by which this unifying power is put into effect. Only in the Fourth Gospel does Thomas receive any emphasis (11:16; 14:5; 20:24–28; 21:2). A historical character, he also functions in this Gospel as a character type. He is a combination of seeming courage (11:16) and uncertainty (14:5), but especially is he a stubborn seeker of the truth. Surely his character calls to mind and reflects fellow Christians in the community who, beneath a courageous exterior, manifest both uncertainty and lack of deep faith. To all such, Jesus and John say: “Do not be unbelieving, but believe” (v. 27). There is more ultimate faith in the man who insists on being sure than the man who glibly repeats things which he has never thought out, and which he does not really believe. It is doubt like that which in the end arrives at certainty…. Thomas doubted in order to become sure; and when he did become sure, his surrender to certainty was complete. If a man fights his way through his doubts to the conviction that Jesus Christ is Lord, he has attained to a certainty that the man who unthinkingly accepts can never reach. No other disciples makes such a clear confession of faith. Rather than call him “Doubting Thomas,” a person whose behaviors we should avoid; in the end we should call him “Confessing Thomas.” Shouldn’t we all come to that point in our faith journeys? There is no doubt that John intends this powerful phrasing (Ps 35:23–24) as a, or better the, Christian profession of faith. For the Johannine disciple, Jesus is both Lord and God. With this profession, John creates his own inclusion to the Gospel, the corresponding covers to his book of good news; for “My Lord and my God” at the conclusion corresponds to the opening “ … and the Word was God” (1:1). The two statements are intentionally parallel. Verses 30–31 form a conclusion, the ending to the original edition of the Gospel. What the evangelist has written — which is not all that he could have written — is meant to urge and strengthen belief in Jesus as the Christ — and as the Son of God. John has already given us this profession in 11:27 on the lips of Martha in the context of another raising from the dead. To live, to really live, is to believe this: that Jesus of Nazareth is indeed the Messiah. Vere homo, vere Deus. Truly man, truly God. John’s theology becomes evident through observing the reactions of the participants. How do they arrive at belief in the risen Lord? In the opening scene, Mary, a minor character, sees the stone moved from the tomb. Her reaction is the natural one: “They have taken the Lord from the tomb” (v. 2). She does not yet believe. Peter and the Beloved Disciple, the central actors, proceed to the tomb with haste (and hope). They see the burial clothes and head wrapping. Peter remains perplexed, but the response of the Beloved Disciple is one of faith. “He saw and believed” (v. 8). This loved and loving disciple saw only the minimum yet believed. In the following scene (vv. 11–18), Mary now becomes a major character. She still holds the natural explanation (vv. 13, 15 repeat the substance of v. 2). She comes to faith only when she has heard (v. 16) and seen the Lord (v. 18). Jesus’ sheep recognize his voice (10:4). The disciples, introduced in Scene 2, become central in the scene that follows (vv. 19–25). Beginning in a state of fear, they pass from fear to joy “when they saw the Lord” (v. 20). For them, too, faith comes through seeing. Thomas, a minor character in verses 19–25, becomes central in the final scene. His stance is one of extreme incredulity. He will not believe unless he sees and touches (v. 25). And so Jesus invites him to faith through sight and touch (v. 27). 20:19 the disciples: by implication from John 20:24 this means ten of the Twelve, presumably in Jerusalem. Peace be with you: although this could be an ordinary greeting, John intends here to echo John 14:27. The theme of rejoicing in John 20:20 echoes John 16:22. Literally, the Greek expression is eirēnē hymin – there is no verb – meaning “peace to you.” Many translator prefer the declarative statement that peace is already among the disciples. 20:20 Hands and . . . side: Luke 24:39-40 mentions “hands and feet,” based on Psalm 22:17. Where the Lucan account is apologetic in nature, here the Johannine description is revelatory. 20:21 As the Father has sent me, so I send you: By means of this sending, the Eleven were made apostolos (apostles), that is, “those sent” (see John 17:18), even though John does not use the noun in reference to them. A solemn mission or “sending” is also the subject of the post-resurrection appearances to the Eleven in Matthew 28:19; Luke 24:47; Mark 16:15. Especially in John one must also keep is mind the Messiah’s mission: “For God did not send his Son into the world to condemn the world, but that the world might be saved through him” (John 3:17). To express Jesus’ being sent by the Father, here the evangelist uses the verb apostellō, while for the disciples’ sending by Jesus he uses the verb pempō. However, nothing should be made of this, as the words are used synonymously in the Fourth Gospel for the sending of Jesus by the Father (e.g. 3:17; 5:36/4:34; 5:23), the disciples by Jesus (e.g. 4:38/20:21), John the Baptist by God (e.g. 1:6; 3:34/1:33), and various people sent by the Jewish leaders (e.g. 1:19, 24/1:22). 20:22 he breathed on them: The word used for ‘breathe’ is emphysaō, which, though found only here in the NT, occurs several times in the LXX, where it refers to God breathing life into the man formed from the dust (Gen. 2:7; cf. Wisdom 15:11), Elijah breathing into the nostrils of the widow’s dead son while calling upon the Lord to restore his life (1 Kgs. 17:21), and Ezekiel prophesying to the wind to breathe life into the slain in the valley of dry bones (Ezek. 37:9). Receive the holy Spirit: In many places in the Fourth Gospel the promise of the Spirit is foreshadowed (1:33; 4:10, 13–14; 7:37–39; 14:16–17, 26, 28; 15:26–27; 16:7–15). The clearest of these is 7:39, where, following Jesus’ promise of streams of living water for those who believe in him, the evangelist adds, ‘By this he meant the Spirit, whom those who believed in him were later to receive. Up to that time the Spirit had not been given, since Jesus had not yet been glorified.’ In John 7:39 we learn that the Spirit will be given when Jesus is glorified because until this moment, the role the Spirit is to point to Jesus (14:26, 15:26), but now the Spirit becomes the animating dynamos for mission in the world. This scene is often understood as the Johannine version of Pentecost. There are problems with such a view. Thomas was not included (20:24), nor was there any great change in the disciples’ behavior—they were still meeting behind closed doors when Jesus next appeared to them (v.26). If in addition one is trying to harmonize all the Gospels, then one wonders how to explain Pentecost (assuming harmonization is a valid way to compare the Synoptic Gospels and John – and there are serious questions regarding such an effort). Some scholars have suggested v.22 constituted a lesser bestowal of the Spirit to be supplemented with a greater endowment at Pentecost, or that what Jesus was bestowing was not the personal Holy Spirit (the promised Paraclete) but some impersonal power/breath from God. There is little to support either of these views in the Fourth Gospel. Another view is that there was a real giving of the personal Spirit on this occasion, but that the Spirit was only experienced as the Paraclete, the one who replaced Jesus’ earthly presence, after Jesus’ final post-resurrection appearance and ascension. Finally, there is the view that Jesus’ action was symbolic, foreshadowing the bestowal of the Spirit to take place on the Day of Pentecost. All the explanations’ problems assume a harmonization with Pentecost and do not simply let John tells his account. 20:23 Whose sins you forgive: These words have affinities with the teaching of Jesus in the Gospel of Matthew. Jesus said to Peter, “I will give you the keys to the kingdom of heaven. Whatever you bind on earth shall be bound in heaven; and whatever you loose on earth shall be loosed in heaven.” (Matt. 16:19). It also has affinities to what he said to the disciples generally in relation to those who would not heed admonition who must be treated as pagans or tax collectors: “Amen, I say to you, whatever you bind on earth shall be bound in heaven, and whatever you loose on earth shall be loosed in heaven” (Matt. 18:18). The reference to forgiveness (or lack thereof) may echo the reference to “the key to the house of David” in Isa. 22:22. If so, what is at stake is the authority to grant or deny access to God’s kingdom. In a Jewish context “binding and loosing” described the activity of a judge who declared persons innocent or guilty and thus “bound” or “loosed” them from the charges made against them. This is the only place in the Fourth Gospel where forgiveness of sins is spoken about, though the idea of sins remaining unforgiven is mentioned a number of times (8:24; 9:41; 15:22, 24; 16:8–9; 19:11). The non-forgiveness of sins is always related to refusal to believe in Jesus. It is important to notice the passive voice used in the statements in this verse regarding the forgiveness and non-forgiveness of sins. They function as divine passives reminding us that God alone forgives sin (cf. Mark 2:3–12; Luke 5:17–26) and Jesus’ disciples declare what God does. 20:21-23: The disciples’ commissioning in 20:21–23 climaxes the characterization of Jesus as the sent Son and shows Jesus’ followers as drawn into the unity and mission of Father, Son, and Spirit (cf. 15:26–27; 17:21–26). Succession is important both in the OT and in Second Temple literature. In the Fourth Gospel Jesus succeeds the Baptist and is followed by both the Spirit and the Twelve (minus Judas), who serve as representatives of the new messianic community. OT narratives involving succession feature Joshua (following Moses) and Elisha (succeeding Elijah). 20:25 Unless I see the nail marks: Thomas’ refusal to believe is expressed using the double negative (ou mē), showing he was adamant about this matter. The same double negative is used describing Peter’s refusal to allow Jesus to wash his feet (13:8). 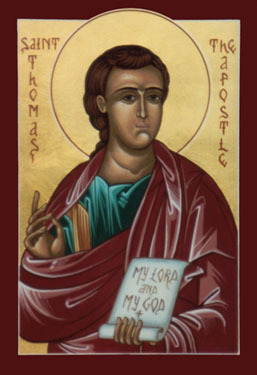 While it may appear that Thomas was unbelieving, more so that the other disciples upon receiving their first witness, this is not necessarily the case. Earlier references to Thomas reveal one who was dogged in his commitment to Jesus (11:16) and honest about his doubts (14:5). Thomas is the one who questions, and perhaps by his questioning comes to a deeper faith that the others. 20:26 the doors were locked…stood in their midst: This account points to a clear bodily resurrection against a docestic tendency to spiritualize the Resurrection. At the same time, the account points to a post-Resurrection body that differs from earthly life. 20:27 do not be unbelieving, but believe: In the Greek, me ginou apistos alla pistos, lit., “not be/becoming not-pistos but pistos.” Lowe and Nida (Greek-English Lexicon of the New Testament Based on Semantic Domains) give three definitions for the adjective pistos. Do not become unfaithful, but faithful. Do not become uncertain, but certain. Do not become distrusting, but trusting. Thomas seems to be at a crossroads in his life. What will he become? What adjective will describe him: trusting or not, faithful or not, certain or not? 20:28 My Lord and my God: this forms a literary inclusion with the first verse of the gospel: “and the Word was God.” A number of commentaries note that a possible origin of the confession “My Lord and my God” is derived from a contemporaneous expression: Dominus et Deus noster; “our lord and god”) used by Emperor Domitian for himself. Domitian was emperor when John is believed to have set his gospel in final written form. It is possible that John is making things clear for who truly is “Lord and God.” And it is not Domitian, or anyone or anything else to whom/what we might give our allegiance. 20:29 Blessed are those who have not seen and have believed: This verse is a beatitude on future generations; faith, not sight, matters. This is the second pronunciation of blessing by Jesus in the form of a beatitude in the Fourth Gospel (cf. 13:17: “If you understand this, blessed are you if you do it”). 20:30-31 come to believe: These verses are clearly a conclusion to the gospel and express its purpose. While many manuscripts read “come to believe” (pisteusēte), possibly implying a missionary purpose for John’s gospel, a small number of quite early ones read “continue to believe,” (pisteuēte) suggesting that the audience consists of Christians whose faith is to be deepened by the book (cf John 19:35). Perhaps, this is to read too much into the choice of tense, because elsewhere in this Gospel pisteusēte can denote both initial faith (1:7; 4:48; 6:30; 8:24; 9:36; 11:42; 19:35) and ongoing faith (11:15, 40; 13:19; 14:29), and pisteuēte is used to denote both initial faith (6:29; 10:38; 17:21) and continuing faith (6:35). G. K. Beale and D. A. Carson, Commentary on the New Testament Use of the Old Testament (Grand Rapids, MI; Nottingham, UK: Baker Academic; Apollos, 2007). Leon Morris, The Gospel According to John, The New International Commentary on the New Testament (Grand Rapids, MI: Wm. B. Eerdmans Publishing Co., 1995). 135-41. Over the years I have compiled notes, documents, and items of interest about Scripture. Mostly for my own use and in teaching Bible studies in Catholic parishes. The idea was possible to make something that is approachable, more than “Bible 101″ yet not too overwhelming, yet with notes for people who want more – and hopefully even if a person feels “stretched” by the content, it is not too much. I have come to realize I have developed a little library – and so I thought I would share some. When I began to compile I made no attempt to be careful about sourcing, copying entire passages, foot-noting, or the even the modicum of appropriate credit – and so there is likely a lot of content that is not my own. My apologies to all. This entry was posted in Catholic, Scripture and tagged doubting thomas, Jesus, Thomas, upper room by Friar Musings. Bookmark the permalink.